Offended by what the government film board argued was a blatantly westernized adaptation of Tsuneo Tomita's novel Sanshiro Sugata from assistant director and screenwriter turned filmmaker Akira Kurosawa, Japanese wartime censors took action by trimming seventeen minutes of footage from the feature film which has never been recovered to this day. Yet even without the missing 1,845 feet of film, Kurosawa's directorial debut is fascinating to behold, especially in this Criterion Collection retrospective of the Japanese Oscar winner's first four pictures filmed throughout the second world war which have been released in their Eclipse Series of rare, internationally vital cinematic works. And although Kurosawa didn't initially receive the credit he so deserved from his country's film board, once the legendary Yasujiro Ozu made the bold decision to go against the government's opinion by defending Sugata, others decided to give the film (which would ultimately spawn five remakes) a second look. Set in 1882 in a period when the biggest conflict in the land was in deciding whether or not to align oneself with those who practiced judo or jujitsu, Sanshiro Sugata follows its eponymous wandering, headstrong character played by Susumu Fujitu as he becomes the student of the wise judo master Yano. However what the film lacks in plot, Kurosawa managed to make up for in style by incorporating some ingenious framing techniques, daring edits and breathtaking shot composition that would eventually become part of his cinematographic approach. He manages to convey the passage of time through the use of nature as the weather changes repeatedly while the camera focuses on a shoe left in the same place to again using a shoe as a sort of Cinderella homage to fairytale romance when our protagonist meets the daughter of his rival in a scene that no doubt has had an influence on other directors. Throughout the work, Kurosawa never fails to heighten the dramatic intensity by the unorthodox yet effective decisions to insert subtext simply by utilizing visual cues. He uses allegory masterfully on both a subtle level as characters are seen against two very different backdrops while speaking to one another in a way that invites us to truly understand more than what they're saying as well as in a more dramatic approach such as in a bravura martial arts showdown in the wind. 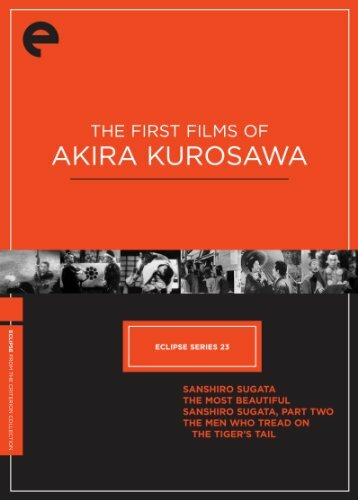 Well worth analyzing for its educational impact in the realm of editing and cinematography, Sanshiro Sugata is also the most impressive early work in this box set in foreshadowing the other films that Kurosawa would eventually make both from a stylistic standpoint as well as a storytelling one as his admiration for the knowledge seeking wandering hero journeying to find himself never faded. Despite Akira Kurosawa's wish to resist both political and cinematic peer pressure to make a propagandist World War II picture, eventually he followed suit with this patriotic effort. In his second feature film, The Most Beautiful, Kurosawa managed to simultaneously manipulate and rivet viewers with an emotionally charged piece that refreshingly focuses on the role of female factory workers instead of offering a predictable “rally the troops” band of brotherhood soldier story. While initially the navy had consulted him to use his keen knack for filming action in a fast paced feature on Zero fighter fliers, once it became evident that Japan would lose the war, Kurosawa replaced adventure on a grander scale for a far more intimate, articulate testament to those who sacrificed everything for the sake of their country. Putting aside his own conflict with the divisive Japanese ideology of “kokutai,” to make the film as personally moving as it is politically charged, he managed to craft what he later referred to as the film most dear to his heart with this portrait of a large group of young women pushed past their limits in a precision optics factory. Wanting to prove themselves as capable to adapt and work harder to fulfill the quota increase in scopes as their male counterparts, the girls who'd traveled from small villages to do their part for their country beg to complete more pieces than the men running the plant had assumed they were capable of finishing. Fighting intense fatigue, irritability, and trying to remain just as active in their other activities in the factory band and playing volleyball during short exercise periods, the girls struggle to overcome disagreements, misunderstandings, and other issues that arise under the guidance of their maternal surrogate, female role model and leader Tsuru Watanabe, played by actress Yoko Yaguchi who would later become Kurosawa's wife until her death nearly forty years later. Obviously influenced by the Soviet grandfather of propagandist filmmaking, Sergei Eisenstein, Kurosawa's picture admittedly does hammer its points home a bit too deliberately. Yet Most Beautiful is nonetheless an exceptionally well-made humanistic feature film. Moreover, considering its uncharacteristically female-centric nature and docudrama style with a neorealist and socially conscious approach of making his actors live the roles they were playing, it manages to set a new bar for narrative propagandist fare made during wartime. Likewise, given its subject, time period and matter-of-fact presentation of female heroics in the smallest of ways, it will be of particular interest to feminist film scholars due to its emphasis on the role of women outside the sphere of home. Perhaps still in propaganda mode from his vastly superior previous picture The Most Beautiful, the first half of the director’s first sequel to his debut smash is far more blatantly propagandist than Beautiful as our martial arts hero finds himself sticking up for a poor rickshaw driver being bullied and beaten by an arrogant American sailor. Later challenged to a “friendship match” between the two countries, Sugata realizes he cannot take his role as a pupil on the lonely path of judo lightly by refusing to consent to the bout, deeming the sport of American boxing senseless and shameful both for the fighter as well as the twisted audience that takes pleasure in watching pain. Kurosawa delves deeper into the psyche of not only Sugata but the original movie’s previously one-dimensional villain Gennosuke Higaki. Having suffered a breakdown following his defeat, Higaki has struck up a truce with Sugata in Part Two. It's with this decision that Kurosawa began experimenting with creating more complicated characters with whom as the Criterion DVD liner notes cite, the filmmaker was fascinated due to his devotion to the literature of Dostoevsky. No doubt hoping to quell his own boredom and distaste for revisiting material he’d already tackled in terms of making sequels, while Sanshiro Sugata, Part Two is important because it gave him the freedom to explore new narrative terrain as a writer and continue honing his visually dynamic technique as a director, ultimately it suffers because he hadn’t quite found the right balance in how to transfer the people from the page to the screen. With more than three villains played like theatrical caricatures that we just can’t take very seriously, we realize that Kurosawa still needed to figure out just what he had to do with actors since he moved from a more naturalistic almost hauntingly real approach in his previous film to something closer to the stage as Sugata marches into its final reel. Beautifully crafted per usual for Kurosawa complete with evocative uses of scenery and shadows throughout, while it’s a disappointing step down from the success of his earlier film, luckily he managed to bounce back with a great handling of “sequel stress” almost twenty years later via Yojimbo and Sanjuro. Since it stemmed from a historically significant incident in twelfth century Japan that served as the basis for many artistic works including Noh and kabuki theatrical adaptations which were the direct source of Kurosawa’s inspiration, the filmmaker’s decision to create a whimsical, Shakespearean tinged “clown” or fool character again found Kurosawa at war with the censors. And instead of trimming the already short fifty-nine minute feature down seventeen minutes as was the case in the original Sanshiro Sugata, The Men Who Tread on the Tiger’s Tail was banned in his homeland for seven years. Rather than accusing Kurosawa of Western techniques, the government felt it was disrespectful for him to add an admittedly subversive and tongue-in-cheek porter who breaks up the drama that occurs when Lord Yoshitsune escapes assassination at the hands of his brother after falsely being accused of sedition with a band of six samurai dressed as priests. Needing to flee to safety by passing through various checkpoints, once the group comes across the porter, the men find themselves having to rely on their wits to try to fast-talk their way out of a dangerous and potentially deadly situation. And despite the fact that it was made using only one set given the fact that the war had depleted the production studios of money to spend, Kurosawa manages to elevate what could be basically considered a filmed play thanks to the casting of the popular Toho studio 1930s comedian Kenichi Enomoto with whom the director had worked a decade earlier while under the supervision of another filmmaker. While it was bogged down thanks to an overly written, far too complicated prologue that introduces way too many characters on a typed screen rather than showing us anything visually, therefore ensuring that Kurosawa’s Men got off to a rocky start, it fortunately improves as it continues, managing to engage us in the first and far from the last work made by the director to focus on legendary samurai.